Hoffman Estates High School Polar Plunge participants received a Great Citizen Award for their charitable accomplishments during a Hoffman Estates Village Board Meeting. Photo courtesy Hoffman Estates Mayor’s Office. Hoffman Estates High School students took an icy plunge for charity earlier this year and it didn’t go unnoticed by members of their community. 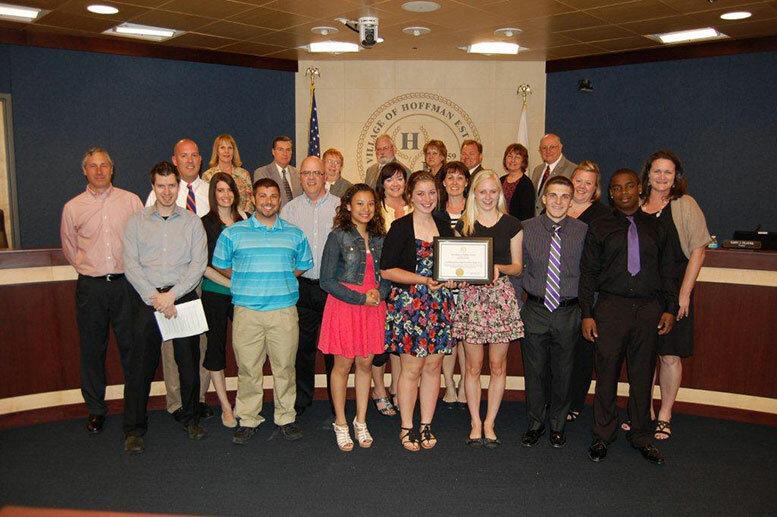 Students and staff who participated in Hoffman Estates High School’s Polar Plunge team were recently recognized with a Great Citizen Award from Hoffman Estates Mayor McLeod for their charitable accomplishments. The HEHS team, Freezin’ for a Reason, joined community members in Palatine at the Twin Lakes Recreation Area during the March 3 Polar Plunge event. The team raised more than $14,000 for Special Olympics, and was given awards for largest group and the most money raised. This is the fourth year Hoffman Estates High School has participated in this event. The Great Citizen Award was created by Hoffman Estates Mayor McLeod to recognize citizens and organizations that were actively and excellently changing the Hoffman Estates’ community for the better. Considered categories of excellence include philanthropic influence, cultural impact, academic achievement and economic development.